Look for thrilling advantures? In the all-new Honda CR-V, even everyday trips can become family adventures. 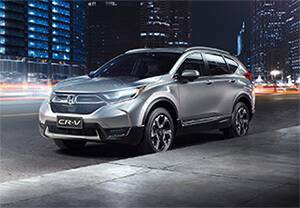 Re-designed from the ground up, the stunningly stylish CR-V is equipped with advanced technology and connectivity, passive and active safety systems and clever storage to boot. With space for the whole family too, it’s adventure ready, when you are. No hesitation in finding out more! Book a test drive and enquire now with Tynan Honda in Sutherland, Sydney through our Service department online.